NEW UPDATED AND EXPANDED EDITION! This explains what Reiki is, how it was discovered and how it links with other energies in humans, animals, plants and the rest of the environment. It outlines some of the latest fascinating research into energy, healing and the mind–body connection, discusses the processes of healing from both conventional and non-traditional viewpoints, and provides comprehensive information about Reiki training, including what to expect on courses at each of the three levels – First Degree, Second Degree and Third Degree/Master. This covers everything you need to know at Reiki First Degree, including methods for self-healing and all the hand positions for treatments on yourself and on other people, how to use Reiki with animals, plants and even inanimate objects, as well as some creative ways of using Reiki, such as working on personal problems or world situations. same effectiveness as a ‘hands-on’treatment. A wide range of other advanced techniques are included, too, such as using Reiki to empower goals, heal emotional problems, create sacred space, and to protect yourself and those you care about. This looks at methods for cleansing and clearing your personal and environmental energies and the increasing importance of spiritual development as you progress along your path with Reiki. It also discusses what is needed to set up as a professional Practitioner, including an outline of the recently introduced Core Curriculum and National Occupational Standards for Reiki in the UK, as well as the role and responsibilities of a Reiki Master and how to train at that level. In 2011 the American edition of Reiki for Life won the Nautilus Book Awards Silver Award in the Health & Healing/Wellness category, which covers proven practices, products and programs that restore, sustain and/or improve the mind, body and spirit. Nautilus Gold and Silver awards are given to print books of exceptional merit that make a literary and heartfelt contribution to spiritual growth, conscious living, high-level wellness, green values, responsible leadership and positive social change, as well as to the worlds of art, creativity and inspiration. 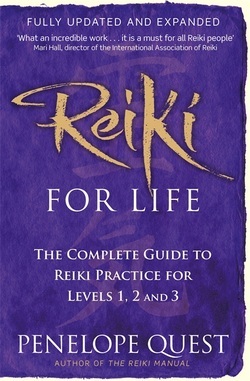 In 2012 the American edition of Reiki for Life was nominated as one of the 5 finalists for the award of "BEST IN REIKI" by the About.com Readers' Choice Awards. An About.com Reader Says: "Reiki for Life by Penelope Quest is an amazing handbook for those who are interested in learning what Reiki is about and how to apply it to oneself. She offers an amazing amount of information pertaining to its history, all three levels, self-healing, cleansing, spiritual growth." Sadly it didn't win, but I think coming 3rd, especially when all of the other authors were Americans, is a pretty good achievement! Translations of "Reiki for Life"
"Reiki for Life" (the same text and illustrations as the 2002 UK edition, not the 2012 edition) has now been translated into Portuguese, and as you can see from the image on the left, it is called "Reiki Para A Vida". Published by Nascente in the middle of 2012, it is already in its 3rd edition (January 2013), and it has been recommended by Joao Magalhaes, President of the Associacao Portuguese de Reiki, who said "Um livro essencial para o estudo e a pratica de Reiki em todo o seu ambito." Of course I don't know what that means, as I don't speak Portuguese, but as it is the endorsement on the front cover I'm guessing it's good! Translations of "Reiki for Life" are also available in Bulgarian, Romanian, and some time this year there will also be an Estonian edition, and hopefully more will follow!